Church and bookstore book signings offer you an incredible opportunity to connect with people, to gain top quality exposure for your book, and to achieve significant book sales. With Xulon’s Book Signing Kit, you’ll have everything you need to hold a book signing in grand style! 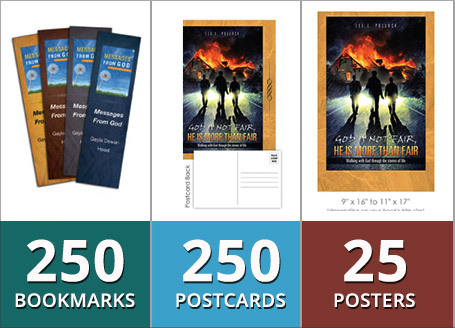 Bookmarks are full-color and measure 2 inches by 7 inches. Postcards are full-color and measure 5.5 inches by 4.25 inches. The Author Signing Kit is limited to authors with a shipping address within the United States. Estimated time from order placement to order delivery is 2-3 weeks. Items may not ship at the same time. Book cover image on all printed items is the final, author-reviewed cover that appears on the author’s book. Color variance between the actual book cover and all printed items in this kit should be expected. Xulon Press cannot honor special requests concerning design or presentation. Once submitted, orders cannot be changed. There can be no refunds or cancellations of kit orders once placed.